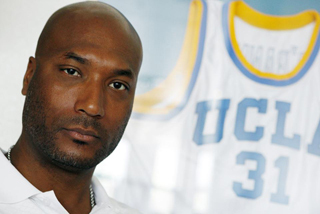 The battle to give top football and basketball players a cut of the billions of dollars flowing into college athletics began in earnest with former UCLA basketball star Ed O’Bannon taking the stand in federal court to describe how he spent long hours working on his game and as few as possible on his grades. The lead plaintiff in a landmark antitrust suit against the NCAA said his goal at UCLA wasn’t to get a degree, but to get two years of college experience before being drafted into the NBA. O'Bannon portrayed himself as a dedicated athlete who would stay after games to work on his shot if he played poorly, but an indifferent student at best. His job at UCLA, he said, was to play basketball and took up so much time that just making it to class a few hours a day was difficult. O’Bannon, who led UCLA to a national championship in 1995, said he spent 40 to 45 hours a week either preparing for games or playing them, and only about 12 hours a week on his studies. He changed his major from communications to U.S. history after an academic adviser suggested it would be the easiest fit for his basketball schedule. “There were classes I took that were not easy classes but they fit my basketball schedule so I could make it to basketball practice,” O’Bannon said. The testimony came as a trial that could upend the way college sports are regulated opened, five years after the suit was filed. O’Bannon and 19 other plaintiffs are asking U.S. District Judge Claudia Wilken for an injunction that would allow athletes to sell the rights to their own images in television broadcasts and rebroadcasts. If successful, the plaintiffs in the class-action case — who are not asking for individual damages — could pave the way for a system that uses some of the huge money flowing into television contracts to pay athletes for their play once they are done with their college careers. Also on the stand Monday June 9, was a Stanford economics and antitrust expert, who testified the NCAA acts as a cartel by fixing the price of scholarships for athletes and not allowing them to make any more money by prohibiting them from selling their names, images or likenesses (NILs) either as individuals or groups. Roger Noll said every expert opinion he’s seen over the last 30 years agrees the NCAA ­violates antitrust laws by paying nothing for the rights and imposing rules that would punish athletes for trying to profit from their NILs. Noll also said that football and basketball athletes in the class-action suit were harmed by not being able to sell their NILs and that the harm was equal to the amount the NCAA received for them in videogames and television broadcasts and what they actually received — which was nothing. Even as the trial began, the NCAA announced it had reached a $20 million settlement in a related case involving videogames that used the likeness and images of players without getting their permission. NCAA attorney Donald Remy acknowledged that the settlement in a suit brought by former Arizona State and Nebraska quarterback Sam Keller will result in some current players getting money but doesn’t change the NCAA’s strong belief that the collegiate athletic model is lawful. O’Bannon, who joined the lawsuit that carries his name after seeing his image used in a NCAA-branded videogame, said he signed a letter of intent that he never read as a 17-year-old eager to display his skills at UCLA. He ended up spending five years at the school, but was seven courses short of graduating when he was drafted into the NBA. He spent two years in the NBA and another seven playing professionally in Europe. He now lives in a Las Vegas suburb, where he makes his living selling cars. O’Bannon acknowledged getting benefits from his time at UCLA, including a free education and room and board. He ended up staying five years instead of two, met his wife at school, and enjoyed his relationship with coach Jim Harrick. He’s proud that his No. 31 was retired and is hanging in the rafters at Pauley Pavilion and of being the MVP in the national title game in 1995. He also cherished his time around the late John Wooden, the legendary longtime UCLA coach. But under cross examination, O'Bannon said he believed athletes should share in some of the money that schools are making off their efforts on the court and field. “If they are generating revenue for their school, I believe they should be compensated at some point,” said O’Bannon, who also agreed with the suggestion that Little Leaguers should be paid because their games are sold on national television and they’re generating revenue.